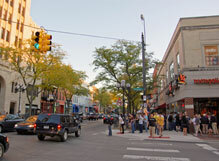 The Michigan Municipal League identified eight essential assets that make communities vibrant places in the 21st Century. Helping Michigan’s leaders grow these assets in their own communities serves as the focus of 21c3. Research continues to show that “place-making” matters more than ever, as an increasingly mobile workforce seeks out neighborhoods before finding jobs and opening up businesses. Our purpose is to help local officials identify, develop, and implement strategies that will grow and strengthen Michigan’s communities in the coming decades. You will find a lot to get you started right on this website, including comprehensive resources, solutions, 21c3’s calendar of education opportunities and events, multimedia, and the latest breaking news. Technical services and assistance are available to the League’s member communities, including diagnostic community audits and prescriptive consulting. We will provide assistance in implementing your strategy, help identify grants and funding, and offer other useful information. 21c3 also works to identify solutions and best practices in these eight asset areas, and offers samples, models, and tool kits aimed at inspiring local leaders to learn from the successes of other communities in Michigan and around the globe. The 21c3 website is a one-stop shop for free news and information on Michigan’s eight assets. Our effort to bring you the latest news and resources benefits from the feedback that you give us. We intend the 21c3 news blog and the League’s Facebook page to inspire Michigan residents in all sectors of society to participate in our mission. We are listening to your feedback. Click here for a PDF of the 21c3 brochure. Local officials play a primary role in setting forth policies that can help to achieve community sustainability and improve quality of life as they relate to creating places that are attractive to live, work, learn and play. Capacity building of local officials and community leaders in this effort is of keen interest to the Michigan Municipal League and its members. The League's Center for 21st Century Communities will assist local officials in identifying, developing and implementing programs and strategies that will enhance the state’s communities as vibrant places for the 21st century. Through our Public Policy forums, research, and education, the League identified the eight assets that Michigan’s communities need to grow and strengthen, for our state to sustain and prosper in coming years. A grant from the Michigan State Housing Development Authority (MSHDA) allowed the League to feature expert speakers with cutting-edge, creative solutions for creating better communities in Michigan. Research shows that Physical Design & Walkability, Green Initiatives, Cultural Economic Development, Entrepreneurship, Multiculturalism, Messaging & Technology, Transit, and Education are essential to a community’s livelihood. The League feels so strongly about the 21c3 program and related assets, that we published a book about placemaking as an economic development tool. Learn more about The Economics of Place: The Value of Building Communities Around People here and on a blog by League CEO Dan Gilmartin here. You can also order it here on Amazon.com. 21c3 shares the ideals and supports the legislative goals of the League’s Prosperity Agenda. If approved, it would create thousands of new jobs in the state, generate billions of dollars in new commercial and residential investments, and create the types of communities Michigan needs to prosper once again. Placemaking is the art of identifying the unique assets of a community to create and develop strategies and outcomes around quality of life and economic sustainability that best connects people with their place. It is an intuitive, emotional and organic process that returns responsibility to the community. mml.org/placemaking is where you'll find video profiles of local communities that have put the placemaking philosophy into action. Experts from around the world agree that investing in communities is one of the most critical elements of any long-term economic development strategy. We believe this is especially true in Michigan, and that "place" matters more than ever.